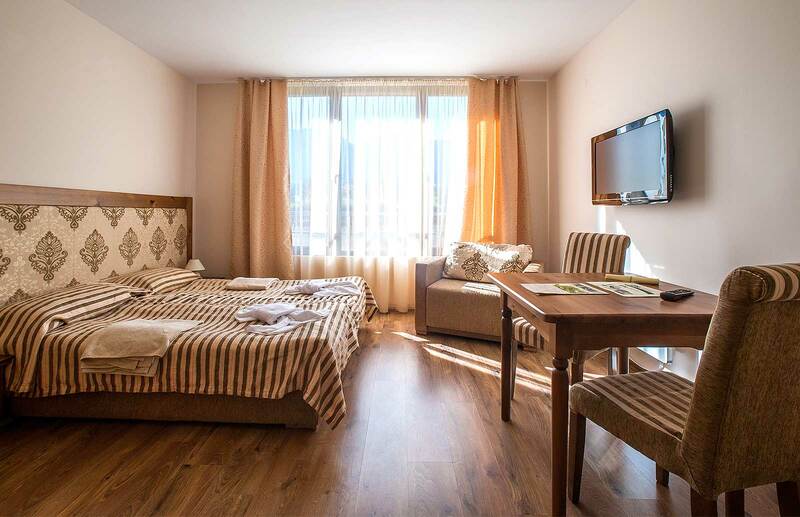 The Studio apartment in Cornelia Family Hotel & Sport consists of 1 room – comfortable and spacious living are with fully equipped kitchenette, dining table with 2 chairs, bedroom/two single beds, single sofa bed for a child as well as WC with shower or bathtub. The studios in Cornelia Hotel & Sport are stylishly furnished and fully equipped with balcony option. Оne-bedroom apartments have living room with kitchenette, dining table and sofas as well as 1 separate bedroom.